I think it might be shipping. i ordered one. amazing range, but that's the norm for Meris. The demos are very impressive. Hearing them right now. I got a shipping notice, so they are indeed shipping. Nice to see a product get released and be shipping at the same time w/o months (or years) or hype/mysterious teasing/etc. Really looking forward to this delay that I didn't even know I needed until a couple days ago. Mine gets here Wednesday! Have the mercury 7 and Ottobit already and love them. This was a no brainer. I'm usually down for weird, but the demos just didn't grab me. Possibly found some of the fx just too over-the-top. I'm going to let that first impression marinate for a few days and go back for another listen. 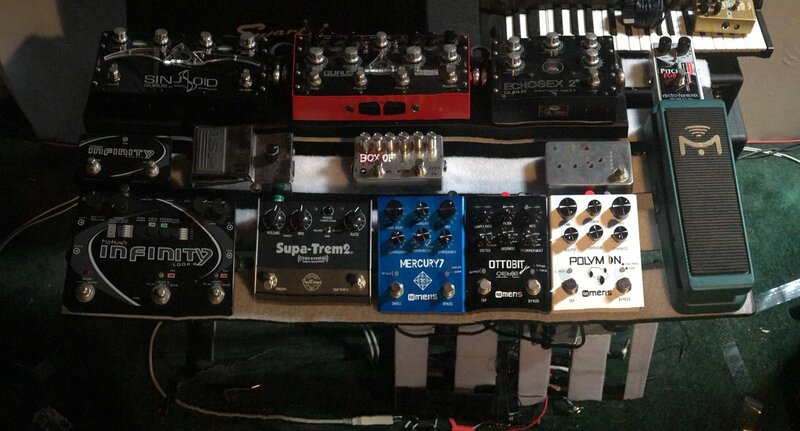 All their pedals are TRS in. Personally I’d be ok with having them slightly larger and having an L and R input, but I think they go the TRS route to keep them small. I am using the Meris Mercury7 and there is no disadvantage using TRS. Got mine today. I've only had time to literally plug it in and set the global settings and then tweak for like 2 minutes, but I love it already. Excited to dig a little deeper later tonight hopefully. Just a quick demo. Init Patch from my OB-6 with no changes. Just programmed a quick 64 step sequence. Yeah, I really like it. Still learning my way around it. just a little room reverb (altiverb) on top of the Meris Polymooon, no other effects, pretty dry other than the pedal doing all the effects. Super duper insane. Thanks for putting this on the radar. More of a time-glitch resynthesis pedal than a tradition reverb, it seems...which is A-OK with me. Super cool. This + Red Panda Particle would be tasty. Definitely not a reverb pedal. It’s a delay pedal with a an interconnected flanger and phaser. The key to it is the dimension section which smears the delay repeats. Since it’s all synced up with the 3 different effects you get some really nice moving textures and motion. Now *that* I'm digging. Sounds great! Yup, much more a delay than a reverb. The "reverb" is from the dimension knob, it's hard to describe what it is other than smearing the delays and moving it back and forth. Still figuring out all the alt functions. I haven't set it to line level, but I haven't heard clipping yet either.Lots of headroom, should work great with any analog synth, maybe even full hot euro levels. It can do normal. dotted, etc. delays, but it can do a lot more. I think I want to try sequencing it with a little bit of CV. It's a must in stereo and with an expression pedal. Morphing presets is something all pedals with a CPU and exp should do. I gave in and bought a bigger board for looping. It's in progress as I wait for a bit power supply in the mail. Coiks Chocolat or whatever it's called. Here's a demo vid I did for the Polymoon, it's such a cool pedal! Haven't really craved a pedal for a while now, this has definitely ended that. Definitely not a reverb pedal. It’s a delay pedal with a an interconnected flanger and phaser. The key to it is the dimension section which smears the delay repeats. Since it’s all synced up with the 3 different effects you get more nice moving textures and motion.